Dyson has been named the national Primetime Pitcher of the Week and Shribman is the Primetime Player of the Week, while 16 others (listed below, with headshots and info. capsule) join them in comprising the Primetime Performer Weekly Honor Roll, as selected by CollegeBaseball360.com. Dyson’s 6-hit shutout helped career the Gamecocks to a sweep of its SEC showdown series at Arkansas, while Shribman hit 8-for-11 with 9 RBI and 4 home runs in leading 4th-seeded Bucknell to an upset of top seed Army in their Patriot League semifinal series. CLICK HERE for the archive of previous CB360 Primetime award winners (scroll down for earlier weeks). SHRIBMAN helped move Bucknell closer to its second Patriot League tournament title during the past three years, as the Bison next will face Holy Cross in the upcoming Patriot League Championship series (Bucknell opened the ’08 NCAAs with a huge upset of Florida State). The 6-4, 220-pound righthanded hitter batted 8-for-13 (.615) from the 5-hole during the Army series (11-9/4-6/11-7), with his 3-game totals including 9 RBI, 7 runs, 4 home runs, 2 doubles and 3 walks. In the tight series opener, Shribman batted 4-for-5 and launched a pair of home runs (plus 2 doubles) – as the Bison beat Patriot League pitcher of the year Matt Fousch. Andrew Brouse homered to lead off the 7th and Shribman left the yard moments later, extending the lead to 8-5. Two innings later, Shribman’s leadoff blast in the 9th provided a key insurance run as Bucknell closed out the game-1 win. Bucknell first baseman Doug Shribman homered from the 5-hole in all three games of the Patriot League semifinal series vs. Army, also batting 8-for-13 with 9 RBI (photo courtesy of Bucknell). Shribman’s third home run of the series (a 2-run shot in the 4th) gave the Bison a 3-1 lead in game-2, but Army rallied to force a third and deciding game. With his team’s season on the line, Shribman responded by batting 3-for-4 with 5 RBI and his third straight game with a home run (also 2R, 2 BB) – a grand slam in the 7th that ultimately supplied the winning 4-run margin. In addition to receiving first team all-Patriot League honors this season, Shribman was a second team all-league selection in 2009 (he played sparingly in ’08, with only 5 at-bats and 23 innings pitched). He is batting .372 this season with 17 home runs (a team and league record), 53 RBI and 16 doubles. DYSON entered the series at Arkansas with only a 4-4 record, but the game-2 starter (behind ace Blake Cooper) navigated through plenty of traffic to post the clutch shutout win vs. a Razorbacks offense that owns a .314 team batting avg., 72 home runs and 8 runs per game. The win sent South Carolina (#14 in the CB360 Composite National Rankings) onto a sweep of #7 Arkansas, allowing the Gamecocks to keep pace with Florida atop the SEC standings. 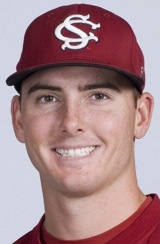 South Carolina junior Sam Dyson fashioned a 6-hit shutout (with 20 outs via Ks or groundballs) to beat #7 Arkansas 5-0, in game-2 of SC's key road series sweep that allowed the Gamecocks to keep pace with Florida atop the SEC (photo courtesy of South Carolina). Arkansas had two men in scoring position to start the day, but Dyson caught Tom Hauskey looking at strike-3 to end the threat. One inning later, he hit Travis Sample with a pitch but promptly rolled up a double-play ball. Bo Bigham ended up in scoring position in the 3rd (after a 1-out single and groundout), but Dyson again worked out of the jam. Dyson continued to manage the game in the 4th – after hitting Hauskey with a 1-out pitch, giving up a single to Sample and seeing the runners move up on a groundout – as James McCann went down swinging to strand the runners and keep SC’s cushion at 3-0. That timely strikeout sparked eight straight outs from Dyson, before Tim Carver hit a 1-out single in the 7th (followed by two more groundouts). Brett Eibner reached on a 2-out HBP in the 8th (Dyson then got Andy Wilkins on a KL) and Carver stroked a 2-out triple in the 9th – with Dyson then walking McCann and getting Collin Kuhn to bounceout to the mound for the final out. (note: additional action photos for some of the other honorees may be added to this page, time permitting). • Must have been playing for or against a CB360 top-50 team (in the Composite National Rankings) or performed a high level in games that could be key to a team’s conference/NCAA postseason qualification; made significant contribution to team’s postseason positioning (single-game wins, “quality” wins, series wins, road wins, etc.). • Involved in clutch performances, such as late game-winning hits, noteworthy comebacks, game-changing plays, team leadership, key defensive efforts, etc. • Performed at a top level against a team rated highly nationally (or within its conference), with bonus consideration given for key performances away from home field and vs. traditional rivals. • Any accomplishment that is rare, historic, record-setting, etc., on a national level. The other 16 members of the CB360 Primetime Performer Weekly Honor Roll for May 10-16 include (see capsules for each player at bottom of release): St. John’s fr. 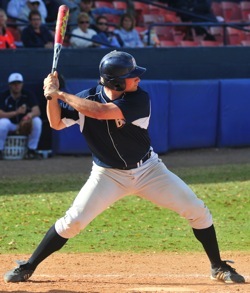 LF Jeremy Baltz (Vestal, N.Y.) … Air Force fr. catcher Garrett Custons (Sarasota, Fla.) … Vanderbilt so. 3B Jason Esposito (Bethany, Conn.) … South Florida jr. RHP Randy Fontanez (Oviedo, Fla.) … Baylor sr. csatcher Gregg Glime (Aurora, Colo.) … Louisiana (Lafayette) senior catcher Chad Keefer (Sasakwa, Okla.) … Southrern Mississippi jr. RF Tyler Koelling (Luling, La.) … Georgia Tech jr. RHP Deck McGuire (Richmond, Va.) … UC Santa Barbara jr. RHP Jesse Meaux (Glendale, Calif.) …Nicholls State sr. RHP Tyler Minto (Mobile, Ala.) … Alabama jr. RHP Jimmy Nelson (Niceville, Fla.) … Kentucky 5th-yr.-sr. catcher Marcus Nidiffer ( Bristol, Tenn.) … Coastal Carolina jr. CF Rico Noel (Lawton, Okla.) … Cincinnati fr. 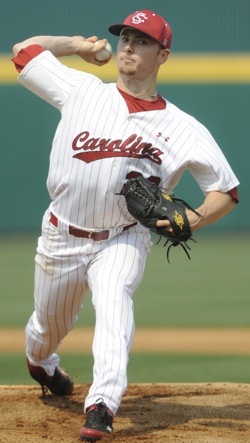 RHP Andrew Strenge (Yardley, Pa.) … Washington State sr. 1B Michael Weber (Seattle, Wash.) … Wake Forest so. RF Mac Williamson (Wake Forest, N.C.). Rookie cleanup batter who turned in rare 4-home run game (7 RBI) during series-opening win at #6 Louisville (8-5) … tied the BIG EAST record for home runs in a game while pushing his season HR total to 18 (tops among the nation’s freshmen) … hit 9-for-18 in four games during the week (9 RBI, 9 R, 5 HR, 2 2B) … compiled a 1.980 OPS (.526 on-base plus 1.444 slugging) during the week … already has set SJU records for HR (18) and RBI (68) in a season. Cleanup batter who stroked a 2-out/2-run triple in 9th inning of series opener at #11 TCU, providing final margin in that 4-2 game (AFA’s second Mt. West win of season) … also singled and scored in game-2 (8-2 loss) and launched home run that opened scoring in close finale (Falcons led 3-2 thru 6 innings; lost 5-3). Game-2 pitcher (behind ace Blake Cooper) who delivered in the clutch at #7 Arkansas, tossing 6-hit shutout that helped sent Gamecocks on to huge road sweep that kept SC tied with Florida atop the SEC standings … shutout potent Arkansas offense that scratched out 6 hits and a pair of walks … faced 37 batters in the 123-pitch outing, with 20 of his outs coming via strikeouts (8) or groundballs (12) … reached a 3-ball count only 3 times over the course of the game. 3-hole hitter who has active streak of 15 consecutive times on-base (breaking 27-yr.-old Vanderbilt record and three shy of tying NCAA record, set by Cal State Northridge’s Shaun Larkin in 2002) … batted 10-for-19 during week that included huge RPI-boosting win at #6 Louisville (11-10, in 17 inn.) and series sweep at Mississippi State (13-8/13-7 in 10/14-4) that helped solidify SEC Tournament spot … his week included 7 runs scored, 6 extra-base hits (HR, 2 2B) and 18 times on-base (5 BB, HBP; also 2 RBI, 3 SB) … his 17th-inning HR provided the final margin in marathon game at Louisville … had rare dual accomplishment at Mississippi State, with a 5-hit effort in game-2 and a 5-walk game in the finale. Second-time selection to the CB360 Primetime Honor Roll who knocked off BIG EAST Conference leader and #19 Connecticut, during 12-1 series opener … limited the Huskies to the lone run on 4 hits and no walks over 7.0 innings … struck out 6 of the 25 batters he faced during that 84-pitch outing … the win helped put South Florida back into contention for a top-4 finish in the BIG EAST. Provided key production from the 7-hole, as the Bears took Big 12 Conference series from #45 Texas Tech (6-2, 3-5, 12-5) … supplied the big hit in the series-clinching final game, as his 5th-inning grand slam pushed Baylor into the lead, 6-3 (he batted 2-for-4 in gm-2, with 5 RBI and 2 runs scored) … earlier hit 2-out RBI double for early 2-0 lead in series opener. Cleanup batter who launched 6th-inning grand slam that gave the Ragin’ Cajuns an 8-5 lead in Sunbelt Conference series-tying game versus #44 Western Kentucky (3-for-5, 5 RBI, 2 R) … Louisiana-Lafayette went on to win that pivotal series, boosting its standing within the Sunbelt Conference and as a potential NCAA at-large entrant … hit safely in all three games of the series versus the Hilltoppers (2-1 opening loss; 4-3 clinching win in 10 innings). Turned in big game from his 9-hole spot (5-for-5, 4 RBI, 2 R, HR, 2B), as team won opener at #21 Rice (11-10) to post key result on its NCAA at-large resume … his third HR of season proved to be a big one, as his 3-run blast opened the scoring in eventual 1-run win over the Owls … also had a hit in game-2 (10-2 loss) and an RBI, run scored and HBP in high-scoring finale (21-14 defeat). Won opener of ACC showdown series vs. #13 Miami (14-3; GT went on to win game-3 and claim series) … allowed only a single run in 7.0 innings pitched, after limiting the Hurricanes offense to 4 hits (plus 3 walks) … struck out 9 of the 35 batters he faced, in the 100-pitch outing. UC Santa Barbara … Jr.
Flashed his stuff in series finale vs. UC Irvine squad that is known for its own quality starting pitchers … worked the full 9 innings of game-3 pitchers duel opposite Eric Pettis (who went 8.1 IP-2R-5H-7K) … picked up the win in that 2-1 nailbiter, allowing the single run on 8 hits and 2 walks … struck out only 2 of the 33 batters faced but also rolled up 13 groundball outs in upset of Anteaters squad that is bidding for an at-large spot in the NCAA Tournament. Went the distance in game-3 series clincher (6-2) vs. Southland Conference leader Texas State, putting a dent in the Bobcats’ NCAA at-large hopes should they fail to win the Southland Tournament … racked up 15 strikeouts while holding Texas State to the 2 runs, on 9 hits and no walks … faced 37 batters in the pressure-packed outing, with 117 pitches. Veteran pitcher who picked perfect time for possible his biggest outing of the season, logging a complete game in 4-1 win over #15 Mississippi … that victory squared the Southeastern Conference series, with the Crimson Tide going on to win game-3 and move into a tie for an SEC Tournament spot … struck out 11 while holding the Rebels to the lone run on 4 hits and a pair of walks … faced only 32 batters (five over the minimum) in his 127-pitch outing. Helped Wildcats bounce back from pair of midweek losses (18-17 at Indiana/10-8 vs. Lipscomb) by leading team to sweep of #24 LSU (9-4/6-4/6-3; program’s first seep of Tigers since ’91) that lifted Kentucky back into the SEC Tournament picture … hit go-ahead grand slam. vs. All-American Matty Ott, for winning margin in the series finale … his 11-for-22 with 11 RBI during the week (2HR-2B-2BB-HBP, only 1 K) … posted career-high totals in hits (5) and runs (4) during the wild 10-inning game at Indiana … hit 3-for-5 in series-clinching win vs. LSU. Leadoff batter who sparked key Monday series-clinching win over Winthrop (10-4) and Big South sweep at #39 Liberty (5-2/7-1/5-0) … racked up a gaudy 1.881 OPS (.714 on-base pct. plus 1.167 slugging) over the four games, with his impressive all-around offense including: 6-for-12 batting, 6 R, 3 RBI, 2 HR (8 for season), 2 2B, 8 BB, 5 SB and an outfield assist (scored/drove in 8 runs; 14 total bases on his 6 hits; and 14 times on-base) … played lead role in close opener at Liberty (2-for-3, HR, 2B, 2 BB, SB). 5-hole hitter who homered in all three game (4 total HR) and drove in 9 runs, as #4-seeded Bison knocked off top seed Army in Patriot League semifinal series (11-9/4-6/11-7) … batted 8-for-13 in the series (.615; also had 7 runs, 2 doubles and 3 walks) … his grand slam provided final margin in series finale (3-for-4, 5 RBI, 2R, HR, 2 BB) and gave him 17 HR for season (team & league record) … homered twice in tight opener (4-for-5, 4 RBI, 2R, 2 2B), helping beat Patriot League pitcher of the year Matt Fousch … his 2-run blast in game-2 gave Bison 3-1 midgame lead. Repeat selection to Primetime Honor Roll, adding game-3 win over #30 Pittsburgh (one week after helping upset UConn) … has not allowed an earned run in 22.2 consecutive innings (nation’s longest active streak and 6th-longest by D-I pitcher this season) … allowed only an unearned run in 8.0 innings of the 3-1 win versus the Panthers … faced only 30 batters in that 117-pitch outing, with 9 strikeouts, 8 hits allowed and no walks. Another back-to-back member of the Primetime Honor Roll, after helping lead WSU back into the NCAA Tournament discussion with a strong 4-1 week vs. fellow NCAA hopefuls (9-4 vs. #26 Cal; 6-5 at Portland; and 7-8/6-5/9-3 series win at #28 Stanford) … entered week with only 2 HR this season but hit 4 homers from the 3-hole, spanning the 5 games (9 RBI-7R-BB) … played huge role in comeback that won Stanford series (2-run HR in 6th to tie game; then grand slam as part of 7-run rally in top of 9th) … also had early 2-run HR at Portland and another blast in opener at Stanford (cutting Cardinal lead to 3-2). Delivered several key hits from the #6 spot in the batting order, as Demon Deacons posted series upset of #23 Clemson (9-5/5-17/11-2) … entered series with only 5 home runs this season but left the yard twice (4 RBI) in opening upset of the Tigers … collected hits in all three games of the series, contributing a run scored, walk and stolen base in the series-clinching win.